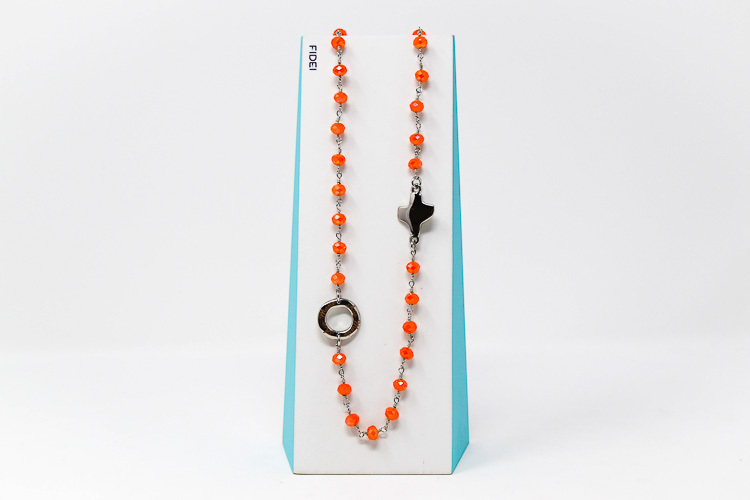 DIRECT FROM LOURDES - Elegant Fidei Silver Rosary�Necklace with Coral Crystals. Elegant Fidei Silver Rosary�Necklace with Coral Crystals. Elegant Fidei silver rhodium plated 3 decade rosary necklace with a clasp and coral crystal beads. The rosary necklace has a round medal with the wording Ave Maria and a cross. Crystal beads measure 4 mm. Length of necklace is 28 cm 11 inches closed and 56 cm 22 inches open approx.